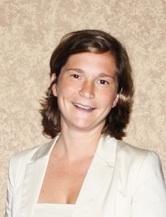 ← Microinsurance in LAC 2014 – towards mass market insurance?! This blog primarily draws from a study published by Making Finance Work for Africa and the Munich Re Foundation aiming at updating and expanding on the 2010 Africa landscape study. Key Findings: With also some key data points on the left. Although there are many organizations that offer community-based health cover, their individual volumes are very low. Geographically, Southern and East Africa dominate in terms of coverage volumes. West Africa is on the rise, largely due to growth reported in Ghana and Nigeria. In Central and North Africa, the microinsurance sector remains rather limited. Southern Africa shows the majority of lives covered by life and life and a large portion of credit life products. This is because of strong cultural promotion of funeral insurance in that region. West Africa has the greatest number of people covered by health products primarily because of the strong donor promotion of group ownership of insurance through community-based health insurance programs in Francophone Africa. West and Central Africa have experienced significant growth in property coverage. North Africa: Least coverage overall (together with West Africa), but greatest growth in life and accident products. East Africa presents the largest coverage and growth for agriculture and the most for accident coverage. 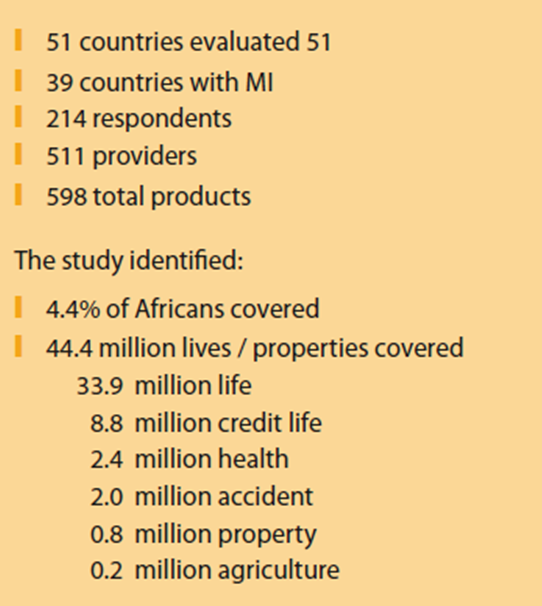 The previous Africa Landscape study with data from 2008 identified a total of 14.7 million lives and properties covered by microinsurance in 32 countries. The current study identified 44.4 million lives and properties covered in 39 countries, a growth of over 200% between 2008 and 2011. However, many things stayed the same, e.g., the market remains dominated by life coverage and Southern and East Africa, still present the largest numbers in terms of coverage. 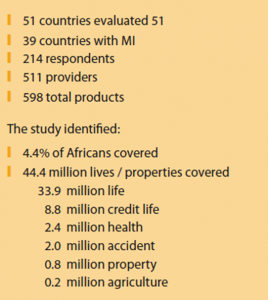 Life coverage is even more dominant in 2011 than in 2008 moving away from credit life products indicating that the African microinsurance industry has begun to move further along an evolutionary path towards more complex products. However, the lack of expansion of health and other products suggests continued constraints. Only modest growth was seen in credit life and health coverage across all regions, with the exception of North Africa which exhibited considerable growth in health coverage. Declines in health cover were identified in Southern and East Africa. Declines in agriculture coverage were experienced in Central and Southern Africa while Central Africa also experienced a decline in credit life and a slight decline in life and accident coverage. North and West Africa which experienced the greatest growth in life and accident products are those with less coverage overall. Microinsurance providers: 12 different types of organization from commercial insurers to mutuals and hospitals, to NGOs and MFIs taking on insurance risk themselves. Seventy-seven percent of organizations identified were community-based covering only 9% of total lives/properties in Africa. Regulated commercial insurers, are the second most common type (13%) of microinsurance providers and cover 78% of lives/properties in the region, ie., microinsurance growth and expansion will not come from the small scale local organizations but will require the commercial insurance industry and professional mutual insurers. More than 70% of lives covered by health microinsurance are insured by mutuals, cooperatives, and community-based organizations. The absence of commercial insurers from health coverage reflects a general reluctance to enter this market because of real and perceived risks, as well as government provision of health care in several African countries. The majority of properties covered by agriculture products, nearly 60%, are insured by cooperatives. 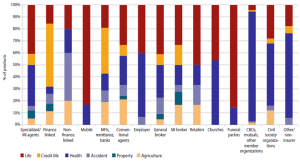 Although most prevalent in East Africa, overall agriculture microinsurance has remained limited. Delivery channels: Providers have expanded their the range of delivery channels since the last landscape study in 2008. 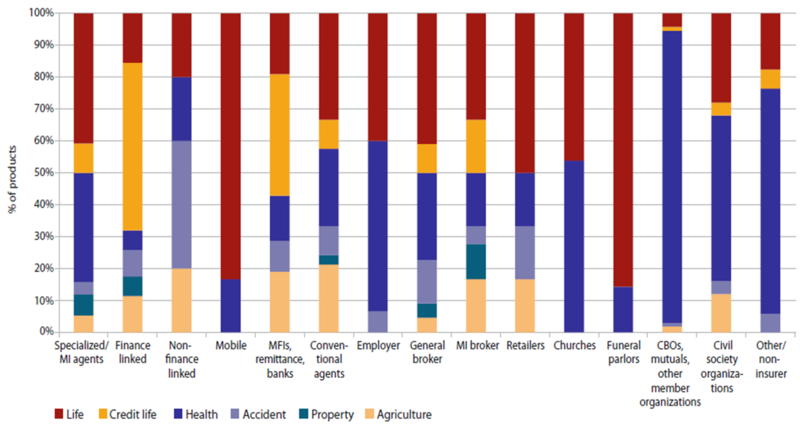 In 2008, African mutuals (including community-based organizations) were the most common delivery channel for micro- insurance, followed by MFIs and they still remain the most common providers. However, the use of specialized and specific microinsurance agents has increased since 2008, and insurers are beginning to link their products, typically life, to more passive delivery channels, much like credit life. One passive channel that has shown tremendous power is mobile service providers. Nine countries in Africa contain more than one million lives and properties insured: Ethiopia, Ghana, Kenya, Namibia, Nigeria, South Africa, Tanzania, Uganda and Zimbabwe. In Ghana, Namibia, Tanzania and Zimbabwe, this achievement is at least partly the result of embedding a simple life cover into airtime purchase of mobile phones. This entry was posted in Allgemein and tagged Africa, Microinsurance. Bookmark the permalink.